Leading Manufacturer of nano filtration systems from Chennai. 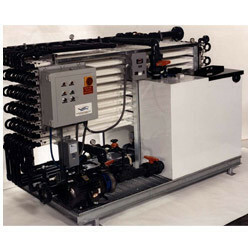 We are engaged in offering Nano Filtration Systems to the esteemed customers. This filtration system is used in various industries like water softening, food, pharmaceuticals, etc for removing water hardness and removing bacteria, viruses and color, as well as organic compounds from water. Due to the features like easy installation, high treatment efficiency and elevated durability these are extremely valued by our clients. We supply these as per our clients requirements and for market leading prices. Looking for Nano Filtration ?